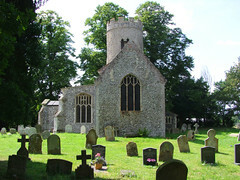 It has been observed that the area south of Norwich has the largest concentration of medieval churches in northern Europe. And yet, some are not so easy to track down. Aslacton is lost in a maze of tree-shrouded narrow lanes. You find it where four of them meet. 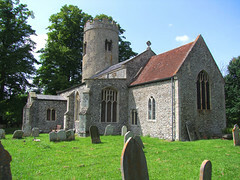 The church sits at a crossroads less than a mile from Great Moulton church, which interestingly is also dedicated to St Michael. 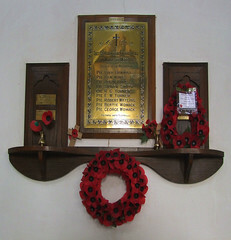 Aslacton is an attractive village, and St Michael is an attractive, welcoming church, as befits one of the Pilgrim Group of parishes. The most striking thing about it is the unequivocally Saxon tower, the double-headed triangular bell openings telling us that everything apart from the battlements was here either before or not long after the Normans arrived and got us all organised. 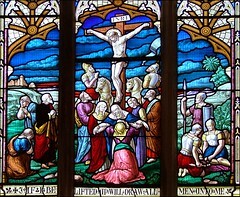 The body of the church is a history of what happened subsequently. 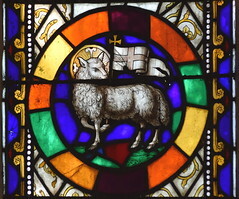 The nave, probably Norman, was supplemented by an Early English chancel which exhibits signs of the Decorated period. 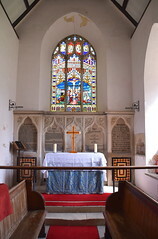 Most likely, given that this is Norfolk, the chancel was built in the Decorated period with idioms surviving from the earlier period. And then the 15th century, which had put the battlements on the tower, brought the gorgeous south aisle, clerestory and porch, completely changing the shape of the church. Although there is only an aisle on one side, the nave is short enough for the interior to feel square, the big windows of the aisle filling it with creamy light. 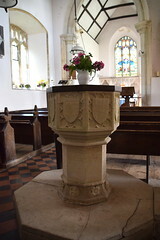 It must have been a very narrow church indeed before the aisle was built, and it is so small that the clerestory appears that of a toy church. 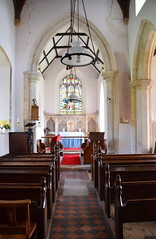 As so often with a church like this, where you enter into the aisle of a small building, the interior appears to unfold before you. 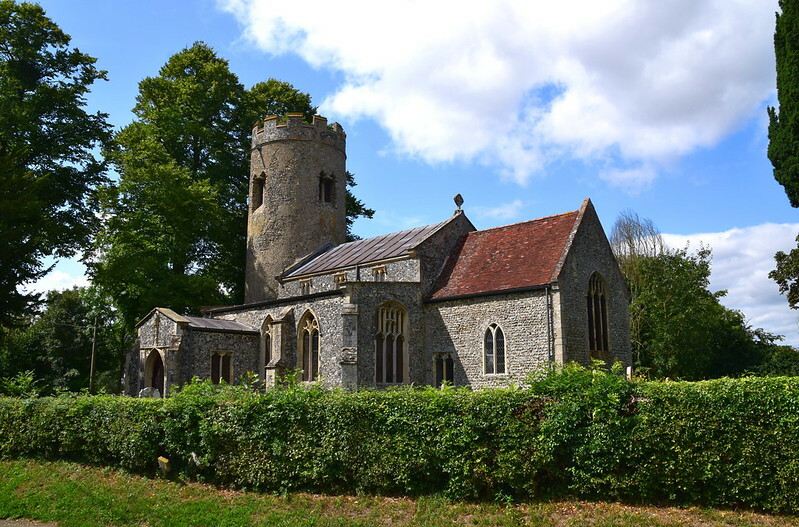 St Michael is not a treasure house, but it is a delightful country church with local character and a sense of being at the heart of its community, a church of ordinary, local people. 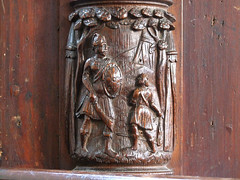 The pulpit is just a simple box built into the north-east corner of the nave, but adorning its south-western corner is an elaborate relief depicting David holding Goliath's head above an action shot of their battle. It looks as if it may have come from a continental organ case. 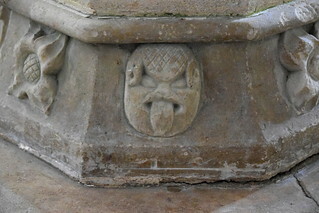 There are a couple of other curiosities. 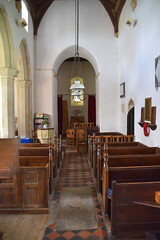 The arcade that divides the aisle from the nave does not line up with the chancel arch, but ends about 60cm short. In between is an alcove. 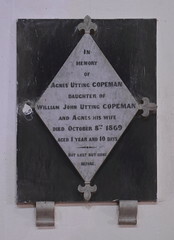 I think it may have contained the rood loft stair, but it is hard to see exactly what happened. Was the arcade begun from the west, while someone was working quite independently on the rood apparatus at the other end of the nave? Or, could there have been an earlier attempt to build an arcade that the Black Death interrupted? 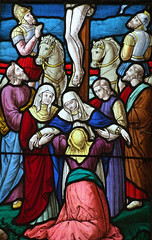 There are bits of 19th century glass, the Lamb of God in the west window, St Michael in the chancel, and a busy, interesting Crucifixion by J & J King of Norwich in the east window. 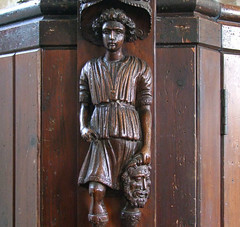 But this is not a church you'd come to wanting to see something in particular. 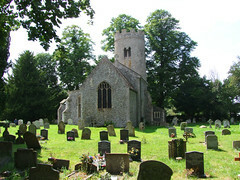 Rather, to experience the sense of an English country church doing what it has done for centuries. 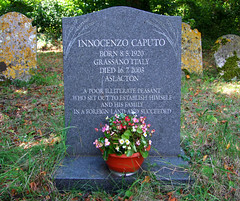 Innocenzo Caputo obviously loved Aslacton. 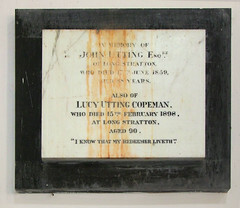 He was a poor illiterate peasant, who set out to establish himself and his family in a foreign land, and succeeded. 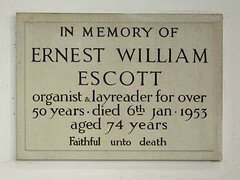 He died in July 2003, and is buried in the churchyard by the porch.